Our equipment aboard the Corwith Cramer constantly monitors sea water temperature, salinity, surface currents, and depth, but the majority of our scientific sampling mission is over, now that we have been sailing for four nights and sampled the geology, physics, chemistry, and biology at three major “super” stations. The next stage is that we are divided into groups to analyze and interpret what we’ve found. We are currently approaching our anchorage at Sun Bay, which is on the southern side of Vieques, a small island to the southeast of Puerto Rico. We are now in our routines. After eating their breakfast (pineapple, grapefruit, biscuits, and gravy! ), C Watch took the deck and is getting ready to furl the sails as we approach the anchorage. B Watch, having sailed the ship from 0300-0700, came off the deck, had their breakfast, and most headed to their bunks to catch up on sleep. This is Catie Alves, and I am the Marine Science Teaching Assistant and Lab Manager with Williams-Mystic. 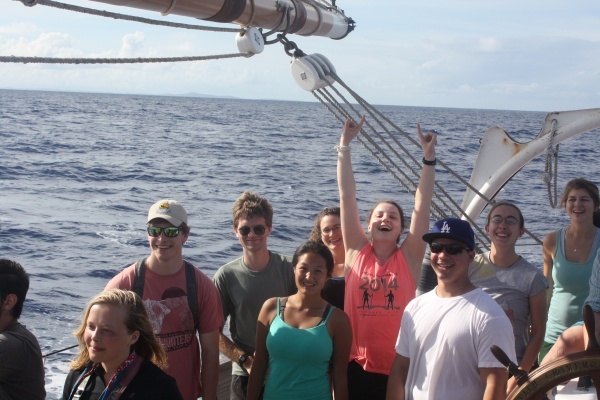 I was on “dawn watch” with B Watch this morning, and seeing the sunrise over the water with the students after a night of sailing is one of my favorite moments aboard the Corwith Cramer. I’ve been most impressed by how everyone is starting to feel more comfortable on the ship. Yesterday was the Pin Chase, which was a friendly competition between watches to test everyone’s knowledge of the pins and their paired lines. One person from each watch was shown the name of a line, such as the fisherman staysail sheet, and they raced to find the location on the ship where the line was “made fast,” or secured to the ship on a pin. The students worked closely with their mates and assistant scientists to prepare for the Pin Chase, and they all did a great job! In the end, the members of C Watch won the Pin Chase! Now that everyone has demonstrated their developing proficiency at handling the ship, we’re spending the next day at anchor in Sun Bay, Vieques. We plan to go ashore this afternoon to snorkel and then this evening to tour the famous Bio Bay and its extraordinary concentration of bioluminescence! I’m looking forward to the adventures that await us in these next few days aboard the Corwith Cramer. Time to strike some sails! The victorious C Watch – Nathan Whittle (Williams), Gar Secrist (SEA Assistant Scientist), Lilia Trissler (Wheaton), Sasha Langesfeld (Williams), Kathryn Wheeler (UMass Amherst), Kevin Hernandez (Williams), and Darcy Cogswell (Trinity), proud of their knowledge of the ship’s lines! 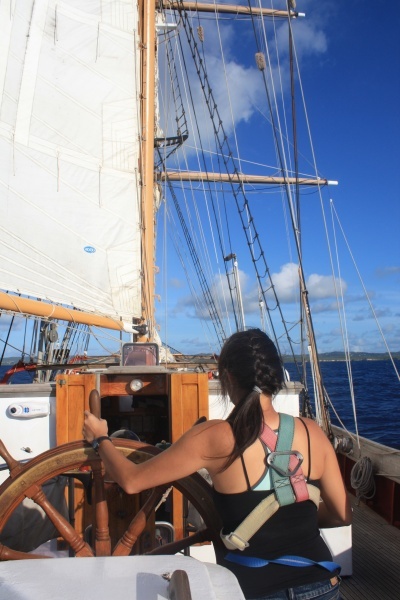 Lilia Trissler (Wheaton) steers the Corwith Cramer toward Sun Bay. Captain Virginia Land McGuire (Williams-Mystic S’90!) gave directions to Lilia and then Darcy Cogswell to sail the ship all the way into the safe part of the bay and dropped the anchor without using the engine. Previous Previous post: S15’s Offshore Adventure Begins!